I wrapped up my last fall semester (ever!) yesterday at 3:00 PM when I turned in my last final. The feeling was glorious. I stepped outdoors, took one look around campus and simply... smiled. Something I feel like I've lacked for the past few days, past few weeks, maybe. I know finals is something all of us college students experience, and it's-tough-we-get-it, but this time, I gave it my all. I think one of my biggest motivators to keep going is knowing how good the end results will be. You just have to find that certain something that motivates you and stick with it. Anyway, enough talk of that because I don't want to see another exam until next year. I know this is peak season for holiday dress shopping, and this dress has to be one of my favorites. 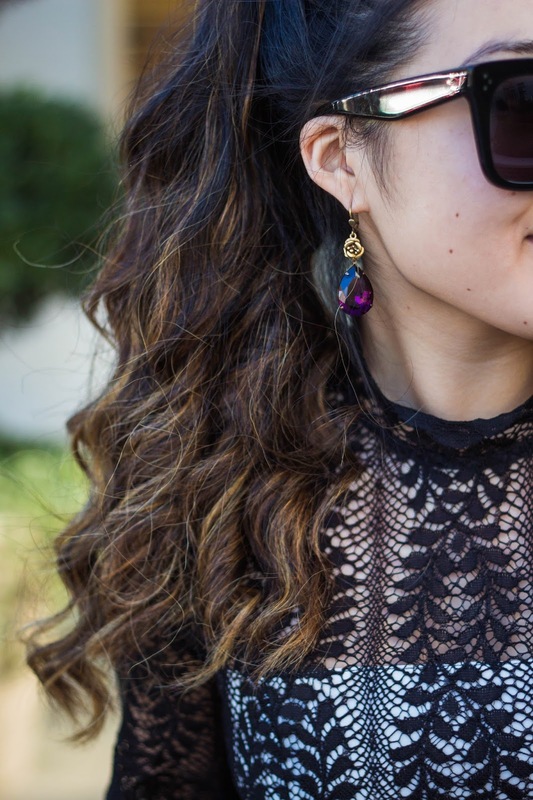 Not only is it a black lace, but it also have voluminous bell sleeves that are so flattering. Luckily, this dress + these shoes are ON SALE for 20% OFF. Hurry before your sizes sell out! P.S. Don't forget to enter to win my TWO $125 GIFT CARD GIVEAWAY with Minted - ends Monday! Hope you all have a great, relaxing weekend. I know I will.